We're giving away three eBook copies of Christopher Webster's survival adventure "New Horizons"! The novel, inspired in equal parts by "Lord of the Flies" and David Fincher's "The Game" follows the story of 15 year-old Marcus Riley who is forced to survive when he is sent to a "brat camp" that is mysteriously free of adults. 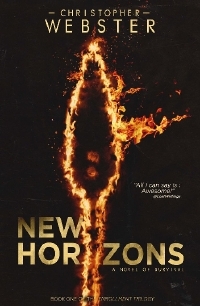 "New Horizons" was published by StoryFix Media. 15 year-old Marcus Riley is The Compound's latest enrollment. A delinquent, kidnapped from his inner-city apartment, he wakes up alone in the wilderness. Left with nothing but the clothes on his back and a cryptic note in his pocket, it seems only his wits will keep him alive... but for how long? To enter, simply send us an email with your name and the title of your favourite survival tale and we'll send you copy. The contest will close on Monday, May 14 and winners will be contacted via email.